Some Jessops stores are bound to close as the company is placed in administration, accountants PwC have confirmed to Amateur Photographer (AP). The chain, which employs around 2,000 people and runs 192 stores, has been hit by ‘reducing confidence in retail’, and poor business forecasts, according to a spokesperson for PwC. In a statement, PwC said that ‘at present, Jessops is not in a position to honour customer vouchers or to accept returned goods’. 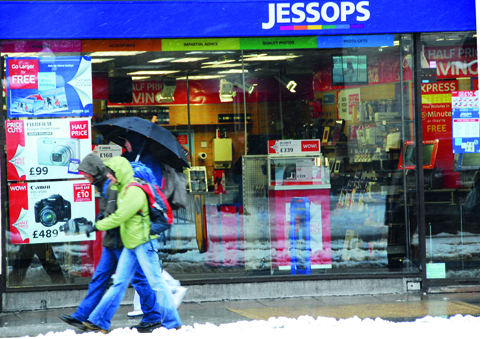 The move comes after talks between Jessops’ directors and its funders broke down. PwC is now holding discussions with the firm’s key financial backers, in a bid to rescue the business. In a statement, administrator PwC said: ‘It has a well-known brand, strong reputation for service and a significant national footprint. ‘However, its core marketplace has seen a significant decline in 2012 and forecasts for 2103 indicate that this decline would continue. ‘In addition, the position deteriorated in the run up to Christmas as a result of reducing confidence in UK retail. ‘Despite additional funding being made available to the company by the funders, this has meant that Jessops has not generated the profits it had planned with a consequent impact on its funding needs. would be owned by its bank, HSBC. At the time, the agreement meant that HSBC forgave £34m of debt owed by Jessops. majority shareholder, HSBC, was poised to sell its share. Speaking today, PwC partner Rob Hunt said: ‘Over the last few days, the directors, funders and key suppliers have been in discussions as regards additional consensual financial support for the business. However, these discussions have not been successful. Hunt added: ‘Our most pressing task is to review the company’s financial position and hold discussions with its principal stakeholders to see if the business can be preserved. ‘Trading in the stores is hoped to continue today but is critically dependent on these ongoing discussions. No-one at Jessops was available for comment when contacted by AP earlier today. Last year, the then chief executive Trevor Moore left Jessops to join HMV. Earlier this week, Jessops told AP it was set to close 15 more shops that have failed to meet its profitability criteria. At that stage, there was no suggestion from Jessops that it faced potential administration. The chain notched up turnover of £236m in the year to 31 December 2012. However, earlier this year, AP revealed that Jessops had made a £0.9m loss after tax, according accounts filed at Companies House. At the time, Jessops pointed out that it achieved a 1.3% growth in like-for-like sales against a general digital camera market decline of 7%. Total turnover had risen by 3%. And the firm’s total profit, before removing factors such as interest, taxation, depreciation and non-recurring costs, rose to £5.6m, compared to £3.9m the year before. PwC was appointed administrator of Jessops Group Limited on 9 January. administrators of The Jessop Group Limited on 9 January 2013. Jessops is a major high- street retailer of photographic equipment and growing on line business. and a significant national footprint. However, its core marketplace has seen a significant decline in 2012 and forecasts for 2013 indicate that this decline would continue. ”Over the last few days the directors, funders and key suppliers have been in discussions as regards additional consensual financial support for the business. However these discussions have not been successful. In light of these irreconcilable differences the directors decided to appoint administrators and we were appointed earlier today.